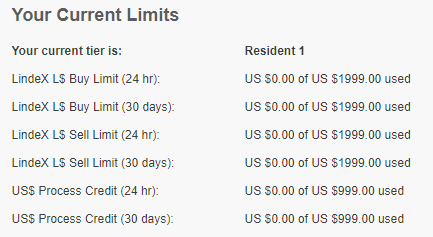 It is now Jan 3rd of 2019 and it still says my 30 day limit is only 1.30. When does the 30day rolling period restart and refresh to my full limit? I do not understand the part I bolded above. Your trading limits 'clock' starts with your first "billing transaction". For many people, that is when they buy L$ for the first time. However, if you sign up for Premium membership before buying L$, the signup is what starts your clock. You can also buy something on the Marketplace and use the "More payment options" at checkout to specify a credit card or PayPal account. Since that is basically purchasing L$, that will start the clock.